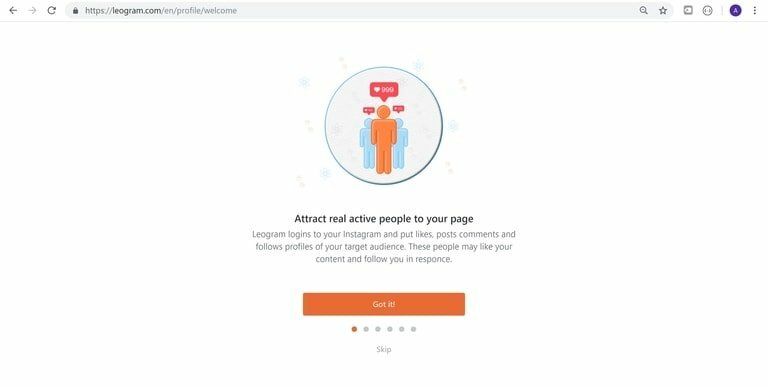 Leogram Review for any influencers who needs a faster and easier way to grow their Instagram followers and engagement with a bot. With Leogram, you’ll get more engagement than with Instagram Pods. Plus, you won’t have to do anything except setup your targets, so Leogram will engage with users. Once the users see your engagement, they’ll most likely engage back with your content and even follow your account. It’s definitely one of the better bots out there like Kicksta, SocialCaptain, Zen Promo, and Instato. Leogram’s interface is super easy to navigate. 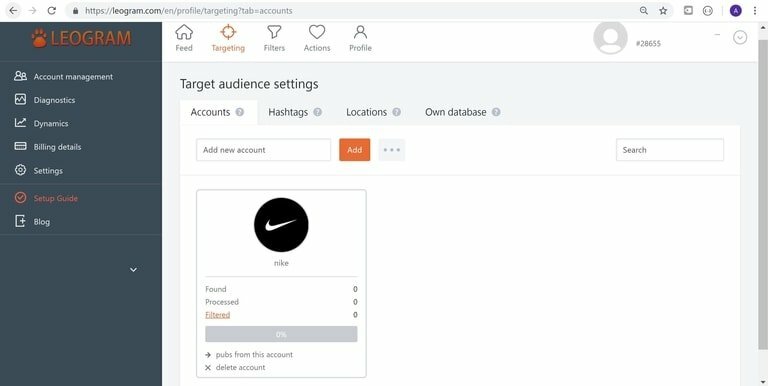 They’ve automated everything you could do on Instagram like Comments, Likes, Follows, Unfollows, Direct Messages, and Searches. 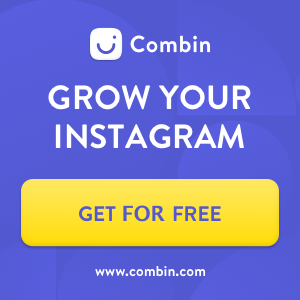 You can easily grow your Instagram on auto-pilot and the only thing you’ll need to do is post content (i.e., pictures, videos, and stories). Leogram uses the same growth techniques as other services. Leogram is a good alternative to Instagooo, Instazood, Instalex, and Bigbangram. Looking for a Leogram promo discount or Leogram coupon code? We have one for you. Leogram Review: Scam or not? Leogram isn’t a scam. We’re positive you’ve seen blog posts with “Is It A Scam?”, “*WARNING*”, or similar click-bait titles while Googling about them. They’re using click-bait titles, so you’ll click on their websites. We’re can assure you Leogram is not a scam. Also, they all use the same verbage in their “reviews”. In addition, they don’t provide any screenshots of using the service to come to their conclusions. Have you noticed that all their social media bot reviews have the same titles on their websites? Have you also noticed they all recommend the same services? Don’t believe them. We’ve done our tests with Leogram. With every bot, we run all our test to make sure it’s completely safe to use, so you can keep your account under Instagram’s radar. We took Leogram for a test run and we can say it’s not a scam or unsafe to use. There wasn’t anything we considered unsafe like ‘Action Blocked’ popups and we didn’t get scam for our money. In addition, Leogram is still going strong and not shut down. You can verify for yourself here. As stated, Leogram is a great alternative for Instagooo, Instazood, Instalex, and Bigbangram. Leogram is relatively unknown at the moment. We got a few requests to test Leogram and we finally got around to writing our review. After our results, Leogram is going to get popular really fast because of its simple settings. Lastly, Leogram gives you full control of your growth, so you can run wild. Need a Leogram coupon code or Leogram promo discount? Skip to thee Conclusion section. What is Leogram? It’s play between Lion and Instagram. Leogram is leading the way as one of the most complete Instagram bots out there right now. It’s features and functionality are robust while being very easy to setup. They definitely make it easy for you to hit the ground running, so you don’t waste your time setting up your filters. 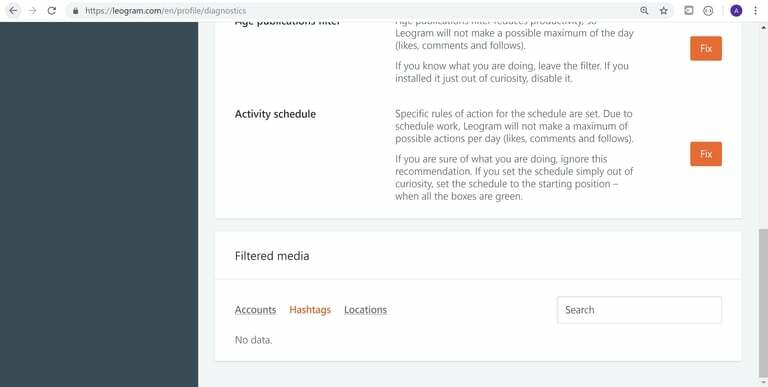 Leogram is a simple yet powerful tool for any aspiring influencer to grow their Instagram. It’ll automate all your Follows, Unfollows, Likes, Comments, Messaging, and more. Biggest perk? 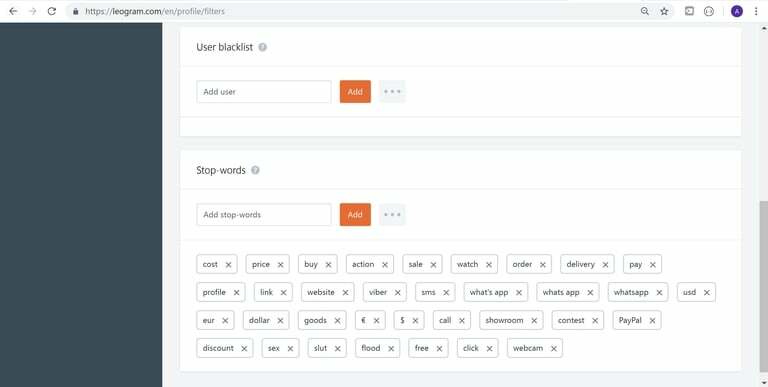 You’re able to blacklist certain words, so you don’t end up with awkward likes. Awkward likes as in liking a picture of someone’s dead dog or something similar. 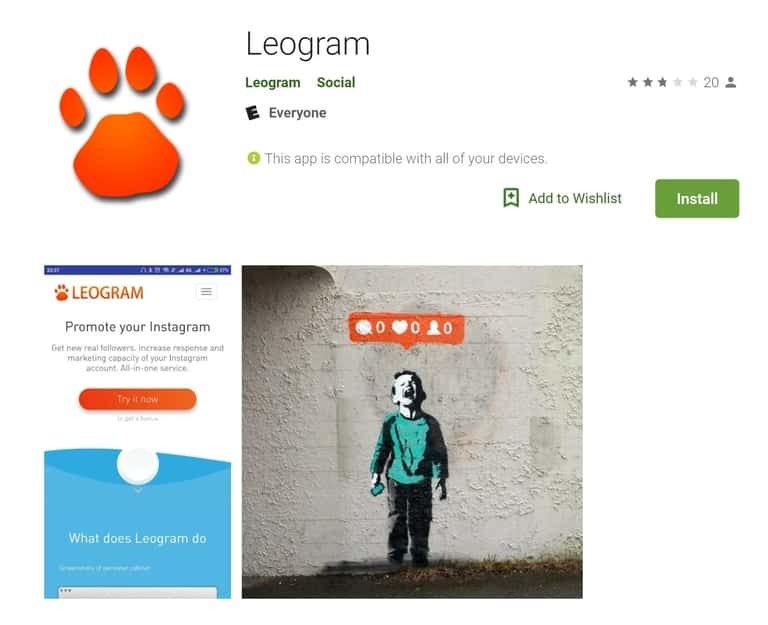 Leogram practically does the same thing as Bigbangram, Instato, Instalex, Followadder, Instazood, Kicksta, Combin (semi-automation), SocialCaptain, Zen Promo, and SARA Agency. However, Leogram has an easy calendar scheduler and you’re able to blacklist words. The two make it very easy and powerful to grow your account on auto-pilot; in addition, it’s very easy to setup and understand like Zen Promo, Instato, SocialCaptain, and SARA Agency. 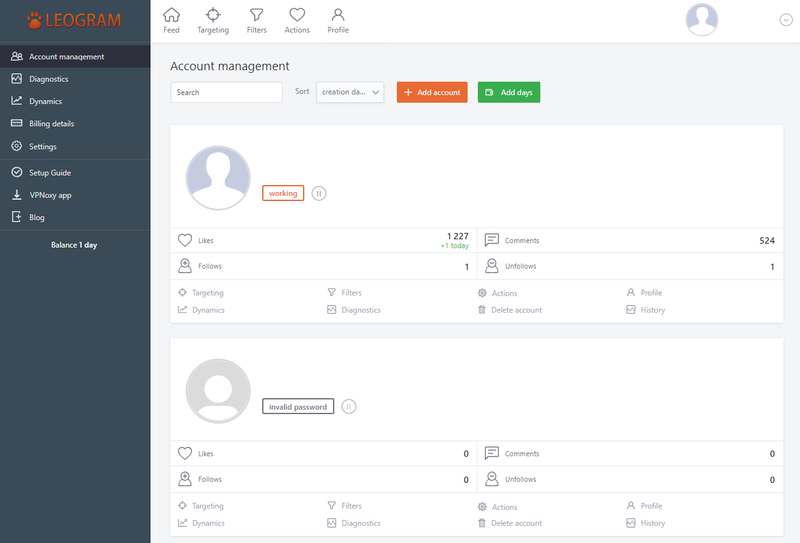 Also, you have the ability to add additional accounts in a single dashboard for easier management. Leogram is an Instagram only automation tool, so it doesn’t work for YouTube, Pinterest, Twitter, LinkedIn, or Facebook. 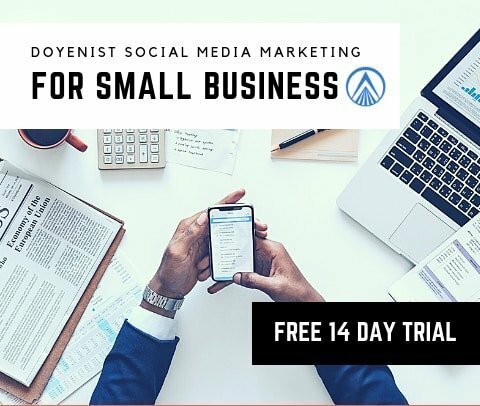 But, Doyenist is provides growth services for the other platforms and they can grow your Instagram account. Leogram is definitely one of our most recommended tools if you’re focus on Instagram. We have a Leogram promo discount and Leogram coupon code for you. Leogram is an online Instagram bot focus on organically growing your account. It’s purpose is to engage with real people versus sending you fake likes and followers. If you’re thinking long-term, organic growth is the correct route to take. 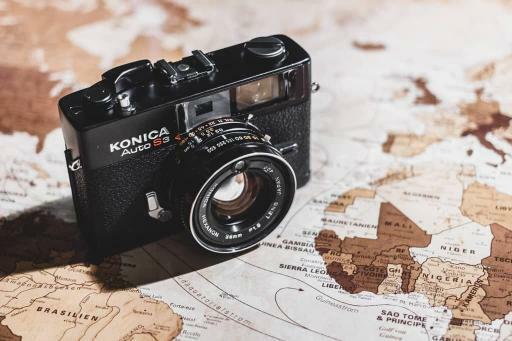 Your Instagram goal should be building a brand with engaged followers; in other words, you goal should be building a community around your account. The community will be your loyal advocates and they’ll become your most vocal ambassadors. We only suggest buying likes or followers when you want quick validation for new products. 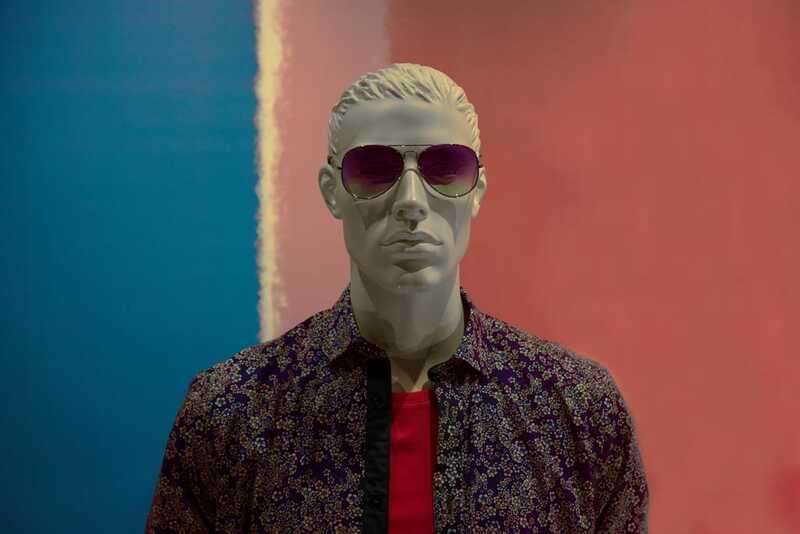 However, you should know the followers you buy online are all fake accounts made to appear real. They’ll never engage with your posts; it’s strictly for appearance only. If that’s your route, you can check out our list of popular websites here. Are you looking for a Leogram promo discount and Leogram coupon code? We have one. Leogram Review: Why Use Automation? Why grow your account on auto-pilot? Well, it’s extremely cheap and efficient. Leogram helps you put down your phone and you’ll able to spend more time perfecting your content. 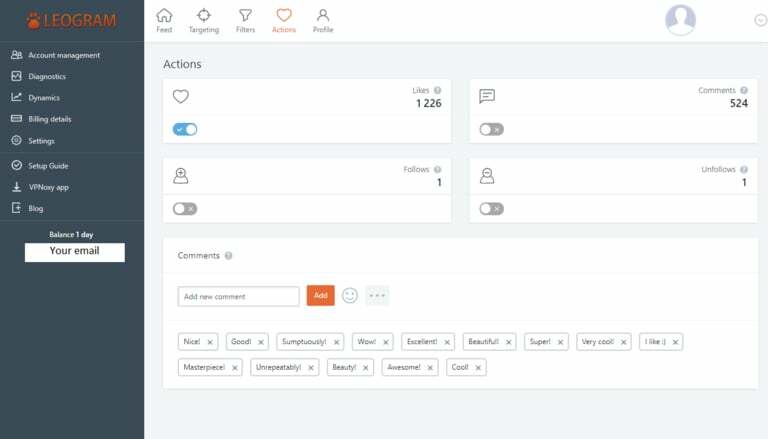 Leogram allows you to automate all your Likes, Comments, Follows, Unfollows, and Messaging. You will never need to engage with other users except for responding to a comment on your post. Leogram will do the tedious and boring task of getting eyes on your account. In addition, it doesn’t cost more than 0.70 cents a day. You’ll be able to spend more time with family, friends, and creating quality content. Leogram frees up your day, so you can focus on other things. Their user interface and settings are simple. Leogram will perform all your Likes, Comments, Follows, Unfollows, and more. You’ll just need to optimize your bot campaign, so you can get better results. In addition, Leogram is 7 times cheaper than the daily $5 minimum for Facebook/Instagram ads. Plus, you can target your competitors followers, so you can steal their audience. 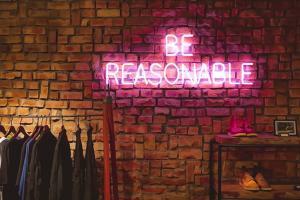 Here’s why you should automate. How do you react when you see new Comments, Likes, Follows, or Messages? Do you get the same reaction when you see a ‘Sponsored Post’ in your feed? We’re pretty positive you react better to Comments, Likes, Follows, and Messages. Leogram is able to give targeted users the same reaction when Leogram engages with them on your behalf. Furthermore, Leogram is pretty low maintenance. Once you optimize your bot campaign, you can literally let it run as long as you want; you just have to login to check if everything is working smoothly. But, we do recommend changing your settings every few days, so Instagram doesn’t suspect anything. If you need a Leogram coupon code or Leogram promo discount, we have a 30 day money back guarantee for you. Leogram’s website is completely secured with SSL. Their Instagram login is encrypted. After signing up, Leogram will give a quick walk through of how everything works. 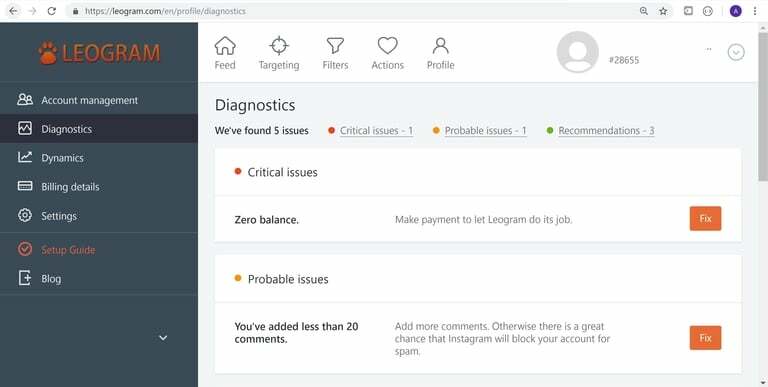 To get started, you’ll need to connect your Instagram account via Leogram’s dashboard. You might need to verify your login via via text or email, but we didn’t have to with our test account. After you login, you’ll be ready to setup your Targeting, Filters, and Actions. Plus, a Delete button for you to quickly remove your account. In addition, you can as many accounts as you wish under the Account Management. It’s a really simple to add multiple accounts and you can easily switch between them. But, each account will need their own settings. The setup process doesn’t take more than 20 minutes unless you have thousands of targets. Plus, Leogram makes it easy for you to change your settings, view growth charts, and see your action history. Each account has a link for their individual settings, charts, and history, so you can navigate to it within seconds. Furthermore, you can easily Add Days on the Account Management tab, so you’ll accounts don’t stop working. Get your Leogram promo discount and Leogram coupon code here. Leogram has a weekly calendar broken down by hours. The calendar makes it really easy for you to schedule Leogram because you can click on hours you don’t want it to run like night time. It’s a really convenient tool because it gives you a visual of your week’s schedule. For example, you can implement ‘Night Mode’ when you sleep; also, you can schedule daily lunch breaks, so you can get on Instagram. It’s great because Instagram won’t suspect anything because you’re logged in on two different IP addresses. It reminds me of the Instagress’ scheduler. We have a Leogram promo discount and Leogram coupon code you can apply at checkout. It’s pretty basic, but they make it really easy to manage all your targets. With Leogram, you can upload all your targets via a txt file. The functionality makes it incredibly easy for you to manage all your targets offline. You can add and remove targets offline then upload them. The whole process doesn’t take more than a few seconds to do. We have a Leogram promo discount and Leogram coupon code you can apply at checkout. Like – Automated Likes based on your targets. Comment – Automated Comments based on your targets. Follow – Automated Following based on your targets. Unfollow – Automated Unfollowing based on your targets. Everything is grouped together under the Action tab. You don’t have to navigate to different tabs to turn on thing off and another on. Leogram does make everything very easy for you to control and change at a moment’s notice. Leogram’s comment feature is pretty awesome. They don’t limit the number of comments you’re allow to add, so you can add as many as you want. The best thing about it is it comes with a few ready to use comments, so you can start commenting right away. You can use our Leogram coupon code and Leogram promo discount. The Stop Words is my favorite Filter I’ve seen with any bot service. For example, you can skip political posts with adding Democrats, Conservatives, GOP, DNC, etc. You can also skip ‘pity’ posts about dead dogs by adding Stop Words like Died, Passed Away, etc. It’s definitely a great feature so you don’t accidentally like or comment on something that will make you look bad. We have a Leogram coupon code and Leogram promo discount you can apply at checkout. This is an invaluable tool. You can easily remedy any possible safety concerns or issues, so you can keep your account safe. We really love the recommendations because it’ll help you optimize your bot actions. Leogram outdid itself with their Diagnostic feature. We have a Leogram coupon code and Leogram promo discount you can apply at checkout. Every Instagram bot service should have a proxy option. Leogram is definitely on par with services that do offer this feature. A proxy will keep your account safe and working instead of being on a single proxy with hundreds of other botting accounts. A proxy adds security to your account, so you won’t get blocked or flagged by Instagram for botting. For example, a proxy will mask Leogram’s IP address with a location specific IP address (i.e., your city). This way Instagram won’t suspect anything and they’ll assum you just wondering around your city logging on different Wifi networks. You can check out our list of recommended proxies here. You can use our Leogram promo discount and Leogram coupon code on your monthly plan here. Leogram does have a lot of great features and functionalities. It’s easy to use, so you can get started within minutes. 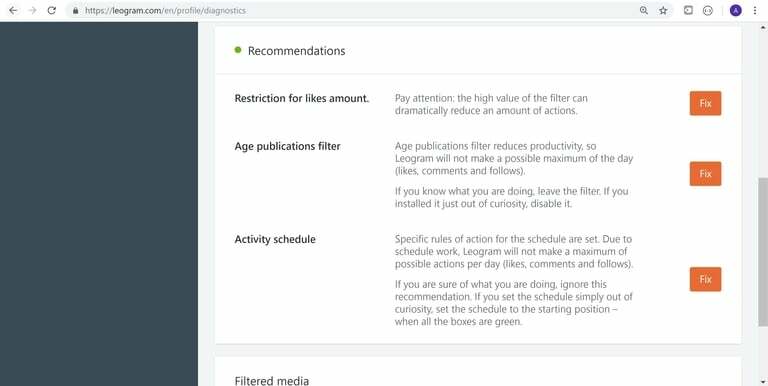 We really like their Activity Scheduler because it gives you a visual of when Leogram is running. In addition, Leogram gives you full control of your settings and growth tactics. You can start botting within 20 minutes of signing up. After setup, Leogram is on auto-pilot. However, we do recommend checking on it at least once a week to ensure everything is working. Also, it’s a good idea to change your settings every few days, so you don’t set off any red flags to Instagram. Furthermore, you should warm-up your account the first few days. 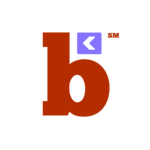 By warm up, we mean setting your initial bot actions to match your actual usage. Why? Instagram will suspect your botting if you go from Liking 15 pictures every hour to Liking 100 pictures every hour. You want to grow your account safely and stay away from ‘Action Blocked’ popups. After a week or so, you can increase the frequency then repeat the process. Get a Leogram coupon code and Leogram promo discount on your monthly plan here. See all of Leogram features here. Get a Leogram coupon code and Leogram promo discount on your monthly plan here. As mentioned, we took Leogram for a test run with our Instagram test account. We used our test account to ensure Leogram is safe to use and we wanted to see what kind of results we’ll get with their service. We are pretty satisfied with the results. Within 4 days, we picked up 191 followers, which is about 48 followers per day. If we had better pictures on our test account, we could have easily picked up more followers. Lastly, Leogram is absolutely safe to use. We didn’t encounter any Instagram ‘Action Blocked’ notifications while using Instagram on our phone. Do you want a Leogram coupon code and Leogram promo discount? Get it here. How much does Leogram cost? Leogram’s plans are based on time periods, which are 14 days, 30 days, 90 days, 180 days and 360 days. The longer the time period the cheaper it is for you. The 180 days is their most popular plan, which costs about $90. It comes out to $0.50 a day, which is incredibly cheap. Want some FREE bonus days added to your plan? Get it here. Do you want a Leogram promo discount and Leogram coupon code? Click on the picture. What do we like most about Leogram? Easy. The Visual Scheduler and the Stop Words. Both features make it really easy to schedule all your activity and keep you out of trouble. You can easily stop the tool when you’re sleeping, so Instagram doesn’t flag your account for botting. In addition, the Stop Words keeps your account from engaging with posts based on certain words. Looking for a Leogram coupon code and Leogram promo discount? We have one for you. Yes! We didn’t encounter any issues while we were taking it for a test run. Is my Instagram password safe? Yup! 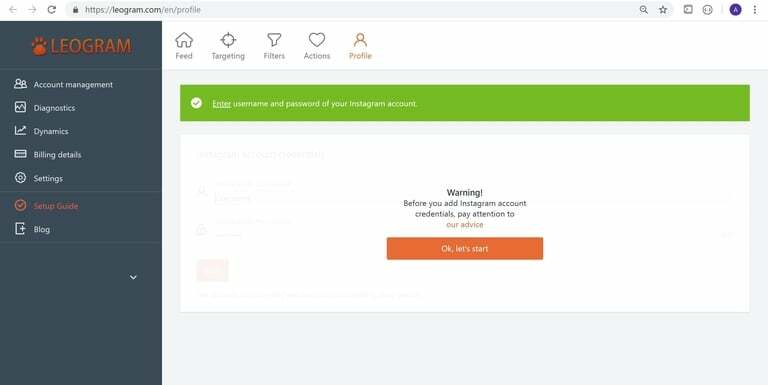 Leogram’s site is 100% secured and their Instagram login is encrypted; however, you can easily change your password if you notice unusual activities on your account. Will they steal or hack my account? We get this question a lot. There’s really no point for any automation service to steal your account. They want to be able to provide a solid service, so you can refer your friends. Their main goal is to monetize their service. Plus, they can easily create an Instagram account then run it through their service to grow it. Will I get shadow banned? People get shadow banned for two reasons: 1) irrelevant hashtags (e.g., #food on a travel picture) and 2) using 30+ hashtags. Instagram considers both practices as spam, so they’ll remove your post from hashtag results. Will my account be suspended or banned? When you’re botting, there’s always a risk of your account being suspended or banned. But, you can keep your account safe by not being too aggressive with your actions, keeping clear of spamvertising, and not posting spammy comments like ‘follow me!’ or emojis. Plus, warm up your account and slowly increase the activity. Want some FREE bonus days added to your plan? Get it here. Get your Leogram promo discount and Leogram coupon code here. Leogram is really unknown at the moment. Influencers have their own favorite bot service. But, Leogram is going to get popular really fast based on our test results and when people catch wind of it. It’s really easy to get started. You’re able to upload your targets with a txt file, which makes managing thousands of targets easier. Furthermore, Leogram is low maintenance. 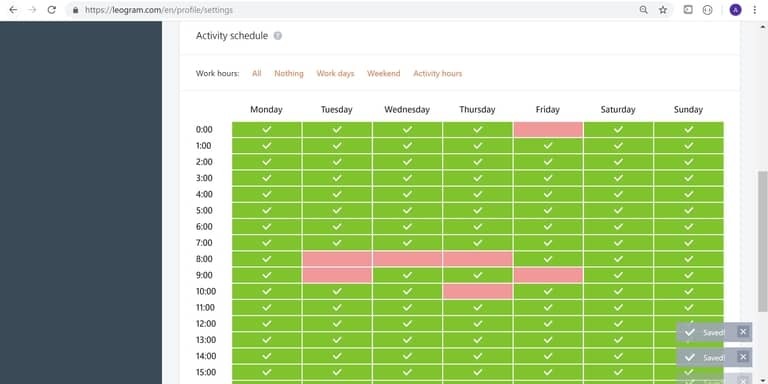 Plus, you can visual schedule all your activity. You can avoid posts with their Stop Words, so you won’t suffer any embarrassing comments or likes. Plus, Leogram keeps a log of everything, so you can monitor all its actions. The ability to add a proxy keeps your account safe and off Instagram’s radar. Want some FREE bonus days added to your plan? The Leogram coupon code and Leogram promo discount will automatically be applied. Furthermore, Leogram is low maintenance. Plus, you can visual schedule all your activity. You can avoid posts with their Stop Words, so you won’t suffer any embarrassing comments or likes. Plus, Leogram keeps a log of everything, so you can monitor all its actions. The ability to add a proxy keeps your account safe and off Instagram’s radar. Want some FREE bonus days added to your plan? Get it here. Subbly Review: Best Way To Sell Subscriptions Online?! Sellfy Review: Best Way To Sell Digital Products & Subscriptions? !